Puppies are born blind and deaf. They are also born in an immature state where their brains and nervous system are still developing. They are never still, they continually twitch, jerk, and stretch their limbs; this helps to develop their nervous system and muscles. Today is day six for these adorable puppies. Their eyes are still closed and should open soon, anywhere between day 7 to day 10. 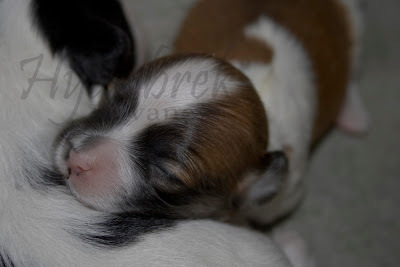 Two days ago already I can spot traces of pigment on their nose and mouth filling in. Today I spot traces of skin peeling off on their ears; their ears will open closer to day 14. Wow. So vulnerable. Thank you for sharing; I had no idea that puppies are born with so much yet to develop.